California Adventure lacks the creativity, originality, and pride that imagineers used to display.The way I see it, if I'm going to go to Calif. to see Calif., I'll see the real stuff, but If I go to Disneyland I want to see the stuff dreams are made of. I think the park can be fixed however. I figure the best way to save California Adventure, is to rebuild. With the current rides, buildings, and potential expansion land, CA could be turned into a DisneySea park. Some of the rides already have a counterpart in Tokyo, ToT, Jumpin Jellyfish, etc. 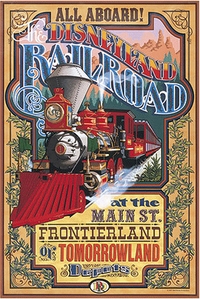 Other CA attractions could be modified, Soarin to match Lost River Delta, the entrance could even remain with a San Francisco theme, the possiblities are endless. With some imagination, and unfortunately lots of money, this park could be converted into a 5-star attraction in no time! In view, a humble vaudevillian veteran, cast vicariously as both victim and villain by the vicissitudes of fate. I love those ideas. Especialy the POTC type ride. That could really be something with today's technology. As far as rockin' rollercoaster. It was reported on my board, a long while back, that when they installed the electric circuits (or whatever they are called) for tot, that they also installed enough for Rockin' Rollercoaster, or another large E ticket ride. Does anyone have info that confirms or denies this? If that is true then there may already be plans for another huge attraction in the works. Something original to DL would be better than another clone, but I'll take RR anyday! They should have the Monorail stop in DCA. I don't necessarily hate DCA but I don't love it either. One issue that just can't stand is the lack of shade. You have these enormous walk ways around the park with benches every what? Two feet :confused: but no shade. Maybe that will come in time who knows. It really annoys me. I can not stand the games area in Paradise Pier! They need to remove those ASAP. I'm sure eventually the park will be fixed to a certain extent but it will never have the full "Disney magic" that other parks have. I just think it's too far gone. I will say this, they did a great job with the food I love the dinning choices at DCA much more then Disneyland. Last edited by Disguy; 01-19-2005, 09:32 AM. I will say this, they did a great job with the food I love they dinning choices at DCA much more then Disneyland. I agree, the food is good. I'm sure eventually the park will be fixed to a certain extent but it will never have the full "Disney magic" that other parks have. I just think it's too far gone. I will say this, they did a great job with the food I love they dinning choices at DCA much more then Disneyland. I agree that the carny games are really annoying and I don't ever see anyone getting that excited over them. They don't compare to arcades or the shooting gallery. I think the ideas to bring DCA some historically themed rides would help big time. Instead of pirates why don't they do a big E-ticket ride themed around Zorro? Or they could do a live action Zorro stunt show. They need to pick a theme though instead of just throwing the Pixar rides in that aren't that imaginative and don't have anything to do with CA. Yes, it can be saved. And yes, it will take forever. The main thing that needs to be replaced is the cheapo section, aka the Warf and San Franscisco. Add more shows and rides there. Does anyone remember the article that Al Lutz wrote a long time ago back when he was still at mouse planet when he did an article about changing DCA into a Disney's America? And yes, it can be done! He brings up some interesting ideas in that one. I'll post a link in a couple of minuites. More importantly, they serve alcohol there. That's the only ticket to enjoying that park right there. For Ralphie, it's the only ticket for enjoying both parks. I've never been to the park either, oddly enough. I've just been looking at maps and participating in "What would you do to raise DCA attendance?" for ages now. I think DCA can be fixed and it will take time. I think it is a little past the point of no return as to changing the entire theme of DCA. I don't think it will be possible for DCA's core -- it's "soul" if you will -- to be changed by any amount of cosmetic theme revisions or ride additions, no matter how much money is spent. The money is irrelevant. DCA is a creation of Disney corporate groupthink. The DCA experience will remain fundamentally generic, prepackaged, and (compared to the vision that created Disneyland) essentially soulless. It depends on the new theme. If they simply drop the word "California" from the name, it would remove the limitation for new lands and rides to be themed only to the golden state. California Sorin' becomes Sorin'. ETC. Doesn't ruin the park, it just opens up the possibilities. It depends on the new theme. If they simply drop the word "California" from the name, it would remove the limitation for new lands and rides to be themed only to the golden state. Ditto this. You could name the place "Disney's ADVENTURE!" and people would still know what it is while the name change is subtle enough that people would recognize something big has happened. Almost nobody actually bothers to include the "California" anyway when talking about the park because of all the syllables, so just drop that part and carry on.